The aim of this study was to review the available literature and define clinical practice guidelines for the use of agents for the prevention and treatment of gastrointestinal mucositis. A systematic review was conducted by the Mucositis Study Group of the Multinational Association of Supportive Care in Cancer/International Society of Oral Oncology (MASCC/ISOO). The body of evidence for each intervention, in each cancer treatment setting, was assigned an evidence level. Based on the evidence level, one of the following three guideline determinations was possible: recommendation, suggestion, and no guideline possible. A total of 251 clinical studies across 29 interventions were examined. Panel members were able to make one new evidence-based negative recommendation; two new evidence-based suggestions, and one evidence-based change from previous guidelines. Firstly, the panel recommends against the use of misoprostol suppositories for the prevention of acute radiation-induced proctitis. Secondly, the panel suggests probiotic treatment containing Lactobacillus spp., may be beneficial for prevention of chemotherapy and radiotherapy-induced diarrhea in patients with malignancies of the pelvic region. Thirdly, the panel suggests the use of hyperbaric oxygen as an effective means in treating radiation-induced proctitis. Finally, new evidence has emerged which is in conflict with our previous guideline surrounding the use of systemic glutamine, meaning that the panel is unable to form a guideline. No guideline was possible for any other agent, due to inadequate and/or conflicting evidence. This updated review of the literature has allowed new recommendations and suggestions for clinical practice to be reached. This highlights the importance of regular updates. Gastrointestinal (GI) mucositis is an extremely common toxicity occurring after chemotherapy and radiotherapy for cancer [1,2]. Mucositis occurs in approximately 40 % of patients after standard doses of chemotherapy and in up to 100 % of patients undergoing high-dose chemotherapy and hematopoietic stem cell transplantation, or radiation for head and neck cancer [3,4], affecting over two million people worldwide each year. GI mucositis is associated with many symptoms of which significant pain, ulceration, abdominal bloating, nausea and vomiting, diarrhea, and constipation are a few . The potentially severe nature of GI mucositis can have some further devastating effects for patients including a reduction or cessation of treatment (which may decrease the chance for remission or cure), and increased stays in hospitals, leading to increased costs of treatment and use of opioids for pain management [5,6]. In addition to the economic costs associated with GI mucositis, there is also a significant impact on the quality of life of cancer patients with increased morbidity and mortality . There is currently a huge unmet market for management interventions for GI symptoms of GI mucositis. There are a number of new agents which have been trialed in the clinical setting. This paper reports the findings of the most recent updated review, against the background of the previous literature, as related to the use of GI agents for GI mucositis. In May 2004, the Mucositis Study Group of the Multinational Association of Supportive Care and Cancer/International Society for Oral Oncology published results of an evidence-based review of the clinical literature on mucositis . These results were then updated in 2007 . Both of these critical reviews examined in detail the literature from January 1996 to May 2002 (original guidelines) and January 2002 to May 2005 (updated guidelines). Where made possible by the literature, evidence-based guidelines were determined both for the prevention and treatment of GI mucositis. It is well recognized that the underlying pathobiology of mucostis is the same throughout the alimentary tract  meaning that regardless of where mucositis occurs in the gut, it will still pose significant problems. What makes the alimentary tract beyond the oral cavity different, however, are the differences in morphology, which are largely related to the specialized function that each performs . While we have made significant progress in our understanding of mucositis “beyond” the oral cavity, progress is difficult due to the relative inaccessibility of the small and large intestine and the obvious difficulty in obtaining biopsies at multiple time points after cytotoxic therapy. Nevertheless, evidence-based guidelines for the prevention and treatment of GI mucositis were able to be formed using symptoms and signs as clinical endpoints. 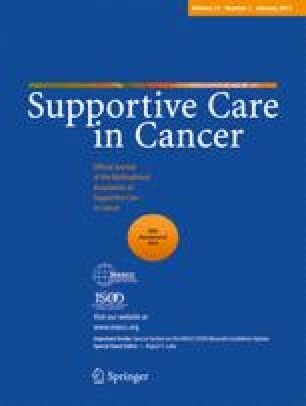 As part of a comprehensive update of the MASCC/ISOO clinical practice guidelines for mucositis, the aim of this project was to systematically review the available literature and define evidence-based clinical practice guidelines for the use of agents for the prevention and treatment of GI mucositis. The methods, including detailed search strategies, inclusion and exclusion criteria, and rubric for assigning levels of evidence to form guidelines, are described elsewhere in this issue. Briefly, a literature search for relevant papers indexed in MEDLINE on or before 31st December 2010 was conducted using Ovid/MEDLINE, with papers selected for review based on defined inclusion and exclusion criteria. Papers were reviewed by two independent reviewers, and data were extracted using a standard electronic form. Studies were scored for their level of evidence based on Somerfield criteria , and flaws were listed according to Hadorn criteria . A well-designed study was defined as a study with no major flaws per the Hadorn criteria. Findings from the reviewed studies were integrated into guidelines based on the overall level of evidence for each intervention. Guidelines were classified into three types: recommendation, suggestion, and no guideline possible. Guidelines were separated based on (1) the aim of the intervention (prevention or treatment of mucositis); (2) the treatment modality (radiotherapy, chemotherapy, chemoradiotherapy, or high-dose conditioning therapy for hematopoietic stem cell transplant); and (3) the route of administration of the intervention. The list of intervention keywords used for the literature search of this section was as follows; 5-aminosalycilates, all-trans-retinoic acid, amifostine, aminoguanidine, atropine, balsalazide, basic water, belly-board, bellyboard, benzydiamine, budesonide, butyrate, cefixime, celecoxib, charcoal, chlorhexidine, cholestyramine, circadian variation, endorectal balloon, exercise, glutamine, hyperbaric oxygen, indomethacin, intestinal alkalization intraabdominal tissue expanders, Kampo medicine, keratinocyte growth factor, kremazin, levofloxacin, loperamide, magnesium oxide, mesalamine, mesalazine, mesh, misoprostol, neomycin, nifuroxazide, octreotide, olsalazine, palifermin, pelvic displacement prosthesis, probiotics, prostaglandin, psychoeducation, racecadotril, relaxation, sodium bicarbonate, sucralfate, sulphasalazine, superoxide dismutase, tantum rosa, thalidomide, ursodeoxycholic acid, and WR-2721. A total of 1,336 papers were originally identified of which 1,040 papers were excluded after evaluating the title/abstract. For detailed analysis, 296 papers were then retrieved with a further 45 papers excluded prior to being sent out to review for not meeting inclusion criteria. Finally, 251 papers were sent out for assessment, with 146 included in the final review. Papers were excluded due to not meeting study inclusion criteria (for more details, refer to Bowen et al. and Elad et al. earlier in this issue). The following interventions were included in the final review: 5-aminosalycyclic acid (5-ASA), acetorphan, activated charcoal, amifostine, antidiarrheal programs, balsalazide, busedinide, cefixime, celecoxib, cholestyramine/leucofloxacin, chrysin, circadian rhythms, formalin instillation, glutamine, hyperbaric oxygen, heater probes, leucovorin, loperamide, mesalazine, metronidazole, misoprostol, neomycin, octreotide, olsalazine, palifermin, physical activity, probiotics, salicylazosulfapyridine, sodium butyrate sucralfate, and sulfasalazine (Table 1). Of these interventions reviewed, one had sufficient evidence to produce a new evidence-based recommendation, two had sufficient evidence to produce new evidence-based suggestions, and one had sufficient evidence to warrant changing a guideline. All remaining interventions had insufficient evidence to form a guideline. The panel suggests probiotic treatment containing Lactobacillus spp., may be beneficial for prevention of chemotherapy and radiotherapy-induced diarrhea in patients with pelvic malignancy. The panel recommends that oral sucralfate not be used to reduce the side effects induced by radiotherapy. The panel suggests that probiotic treatment containing Lactobacillus spp. may be beneficial for prevention of chemotherapy and radiotherapy-induced diarrhea in patients with pelvic malignancies. At this stage, the panel cannot recommend doses/regimen as the studies to date have investigated a wide variety of products. Nonetheless, Lactobacillus-containing probiotics as a class of intervention are to date overwhelmingly positive. In three separate randomized controlled studies [13, 14, 15], patients who received probiotics had significantly reduced diarrhea when compared with control patients. Delia et al. randomized 490 patients to receive probiotics (VSL#3) or placebo following adjuvant postoperative radiation therapy and found that patients receiving placebo had significantly more diarrhea than probiotics patients (p < 0.001). Furthermore, placebo patients had significantly more grade 3 or 4 diarrhea compared with probiotics patients (p < 0.001) . Osterlund and colleagues randomized 150 patients receiving concomitant chemoradiotherapy for colorectal cancer to probiotics (Lactobacillus rhamnosus GG) or placebo. Patients receiving probiotics had significantly less diarrhea than placebo controls (p < 0.027) . Urbancsek and colleagues found in a randomized study of 200 patients receiving pelvic radiotherapy that probiotics (L. rhamnosus) significantly improved stool consistency (p < 0.05) compared with controls. Other studies were similarly positive. The panel suggests the use of amifostine to reduce oesophagitis induced by concomitant chemotherapy and radiotherapy in patients with nonsmall cell lung carcinoma. Updates in the literature since the publication of the 2006 guidelines has seen small studies with conflicting results that do not help to delineate the role of amifostine further [16, 17, 18, 19] and therefore the panel continues to suggest the use of amifostine in this setting. The panel recommends that 5-ASA and the related compounds mesalazine and olsalazine not be used for the prevention of GI Mucositis. There has been no updated literature since the publication of the original guidelines in 2004 . Briefly, three independent randomized controlled trials [20, 21, 22] reported that 5-ASA, mesalazine, and olsalazine offered no protection for patients receiving external radiotherapy. Of concern was that these compounds caused significantly more diarrhea than the placebo counterpart, leading to the early closure of one study . Therefore, the panel continues to recommend against the use of these compounds. The panel recommends that amifostine should be administered intravenously at a dose of ≥340 mg/m2 prior to radiotherapy to prevent radiation proctitis. There have been no updates in the literature since the publication of the original guidelines and therefore the panel continues to recommend the use of intravenous amifostine. No guideline possible. However, in light of emerging research, administering standard radiotherapy for pelvic malignancies may be delivered using circadian rhythm to minimize toxicity in the future. A single well-designed randomized controlled trial , reported findings of 229 patients who were randomized to receive radiotherapy in the morning (8:00–10:00 a.m.) or the evening (6:00 pm–8:00 pm). Patients randomized to the morning arm had significantly worse mucositis overall (p < 0.01) and grades 3 and 4 diarrhea was significantly increased (p < 0.05) compared with patients randomized to the evening arm. Importantly, there was no difference in patient response to treatment between the two arms (p > 0.05) . This study provides novel and exciting evidence of the effect of circadian rhythm on intestinal mucosa. The panel was encouraged by these findings and look forward to more evidence in future years. The panel recommends against the use of misoprostol suppositories for the prevention of acute radiation-induced proctitis. In two separate randomized controlled trials [24,25], men receiving radiotherapy for prostate cancer received either misoprostol suppositories or placebo control. There was no significant difference in radiation-induced proctitis between the two groups; however, patients receiving misoprostol suppositories experienced significantly more rectal bleeding (p < 0.03) . Kertesz et al. however found that although misoprostol did not influence acute radiation-induced toxicity, it had no negative impact on the patients . The panel recommends that oral sucralfate not be used to reduce the side effects induced by radiotherapy. It does not prevent acute diarrhea in patients with pelvic malignancies undergoing external beam radiotherapy, and, compared with placebo, it is associated with increased GI side effects, including rectal bleeding. There have been no updates in the literature since the publication of the original guidelines and therefore the panel continues to recommend against the use of oral sucralfate. The panel suggests the use of 500 mg of sulfasalazine administered orally twice daily to help reduce the incidence and severity or radiation-induced enteropathy in patients receiving external beam radiotherapy to the pelvis. Again, there have been no updates in the literature since the publication of the original guidelines and therefore the panel continues to suggest the use of sulfasalazine. The panel suggests that use of hyperbaric oxygen may be an effective means in treating radiation-induced proctitis. Fifteen studies were reviewed [22, 23, 24, 25, 26, 27, 28, 29, 30, 31, 32, 33, 34,94,95] and were all positive, with many patients experiencing complete resolution of their radiation-induced proctitis. Cost may well be prohibitive, but all studies show similar results. The panel suggests the use of sucralfate enemas as an effective way of managing chronic radiation-induced proctitis in patients with rectal bleeding. There have been no updates in the literature since the publication of the original guidelines and therefore the panel continues to suggest the use of sucralfate enemas. No guideline possible. The previous guideline was not to use systemic glutamine because of severe toxicity. However, three new double-blinded randomized controlled trials published since the last update, have shown effect without severe toxicity. These studies had small numbers of patients and therefore the panel is unable to make a clinical guideline based on conflicting data. Blijlevens and colleagues found that in patients receiving stem cell transplants who received glutamine via parenteral nutrition had significantly improved gut scores (p < 0.001) . Sornsuvit and colleagues also reported that patients who received glutamine maintained their nutritional status , whereas Li et al. reported that glutamine prevented intestinal permeability and clinical manifestations of chemotherapy-induced gut toxicity . When loperamide fails to control diarrhea induced by standard- or high-dose chemotherapy associated with HSCT, the panel recommends octreotide at a dose of ≥100 μg subcutaneously, twice daily. No guideline was possible for the remaining agents due to inadequate and/or conflicting evidence (Tables 2 and 3). Following a thorough review of the recent clinical literature on interventions for the management of GI mucositis, the panel has found sufficient evidence to form just four new guidelines. These include one new recommendation against the use of misoprostol suppositories for the prevention of radiotherapy-induced procititis. Two new suggestions were also made: one in favor of the use of a Lactobacillus spp.-containing probiotic for the prevention of chemotherapy- and radiotherapy-induced diarrhea. Secondly, we were able to suggest the use of hyperbaric oxygen as an effective means of treatment for radiotherapy-induced proctitis. The panel members also reviewed a number of new clinical studies surrounding the use of glutamine, and in light of conflicting evidence, were unable to reach consensus on the formation of a guideline. This is a significant change from previous guidelines where the use of systemic glutamine was not recommended due to excessive toxicity. However, overall it is disappointing that so little has changed in the last 5 years. Although preclinical science is evolving, there is very little in the way of new clinical studies. It is well known that radiotherapy is capable of disrupting the commensal gut bacteria leading to potentially life-threatening side effects . Generally, probiotics are “preparations” that contain sufficient numbers of specific viable bacteria that are able to exert beneficial effects . Over the past 4 years there have been three randomized clinical trials which have shown that probiotics have a significant effect on reducing diarrhea caused by cytotoxic therapies. Delia and colleagues enrolled 490 pelvic radiotherapy patients in a double-blind randomized fashion. Patients who received probiotics containing Lactobacillus spp. had significantly better outcomes than the placebo patients; 31.6 % of probiotic patients had diarrhea compared with 51.8 % of placebo patients (p < 0.001); 1.4 % of probiotic patients had grade 3 or 4 diarrhea compared with 55.4 % of placebo patients (p < 0.001); and average daily bowel motions were 5.1 in probiotic patients compared with 14.7 in placebo patients (p < 0.05) . In a 5-FU-based chemotherapy study, patients who received a Lactobacillus spp. probiotic also had significantly less grade 3 or 4 diarrhea (p < 0.027) and had less chemotherapy-dose reductions as a result of their toxicity . Finally, a randomized controlled study conducted by Giralt and colleagues reported that patients undergoing radiotherapy for pelvic malignancies, who received a Lactobacillus spp. drink had a significant improvement in stool consistency as measured by the Bristol scale . These findings strongly support the clinical usage of probiotics. Advantages of probiotics are that they are cheap, well tolerated by patients, and easy to administer. No studies to date, have reported any adverse reactions to the probiotics in patients treated with cytotoxic therapies for cancer. However, a theoretical concern of increased risk of infection in patients with mucosal barrier dysfunction, particularly if neutropenic, is worth noting. This level of risk is not yet clear, although rare cases of Lactobacillus bacteremia have been documented . Administering cytotoxic drugs according to the body’s natural circadian rhythm is not a new idea. Unfortunately, there is conflicting evidence around administering chemotherapy, and no guideline is possible. However, a single institutional study was conducted by Shukla and colleagues in 2010. They conducted a large randomized controlled trial involving in excess of 200 patients, with cervical cancer. Patients were randomized to receive their radiotherapy in the morning or in the evening, and those who received their radiotherapy in the morning, had significantly increased diarrhea (p < 0.01). Importantly, there was no difference in response to treatment (p > 0.05) . This is in accordance with the animal studies of Ijiri and Potten [32,33]. These studies clearly demonstrated that mice irradiated at varying times of the day displayed different levels of apoptosis. However, as there is only one study in this field, the panel is unable to make a guideline around optimal delivery of radiotherapy. Further well-designed randomized controlled trials are now warranted. This updated critical literature review has also found enough evidence to warrant a suggestion for the treatment of chronic radiation-induced proctitis. Hyperbaric oxygen has been reported to cause neovascularization, reversing the effects of radiotherapy . This review examined in detail 15 studies, and all of them were positive. However, studies reviewed suggested that patients may need up to 50 “dives” to achieve effective treatment. With each “dive” costing many thousands of dollars, it is highly likely that costs will be prohibitive in many cases. Furthermore, as many of the studies reviewed were case studies, with different patient populations, radiation schedules, duration of GI mucositis symptoms, and number of “dives”, drawing any more firm conclusions is difficult. The panel also identified one agent which they recommended against using in the prevention of GI toxicities. Misoprostol suppositories were found to be ineffective in two large double-blind randomized controlled trials [24,25], and in one instance were reported to actually increase the incidence of acute rectal bleeding . Perhaps one of the most important findings from this critical literature review was the change of guideline for the use of systemic glutamine. Previously, literature suggested that this agent caused severe toxicity. However, new literature, albeit small studies, demonstrated that glutamine may be effective without severe toxicities. The panel now is unable to form a clinical guideline for the use of glutamine. It will be critically important to continue to watch for new publications of this agent to see if changes in recommendations are possible in the future. As highlighted by these guidelines, it is important to continue to update the clinical guidelines for the prevention and treatment of GI mucositis. There were several new well-designed studies in the published arena since the last update, allowing panel members to make evidence-based informed guidelines which will hopefully improve clinical practice. The Mucositis Guidelines Update was sponsored by Helsinn Healthcare S.A., Switzerland and BioAlliance Pharma, France. Per MASCC policy, no industry representatives had any role in the development of the guidelines.